The fast-moving nature of the smartphone market makes it pretty difficult, if not impossible, to keep up-to-date. Even if you go out and pick up a device on its launch day, you'll find that after a couple of months, dozens of more recent models have popped up. On a brighter note, short shelf lives mean that price tags can sharply fall, and last year's flagship can be scored for a fraction of its original cost. Case in point, the OnePlus 2, which can be snagged on eBay new and unlocked for a mere $239.99. Having truly disrupted the market with the original OnePlus One, the Chinese start-up then struggled to consolidate its success with the sequel. 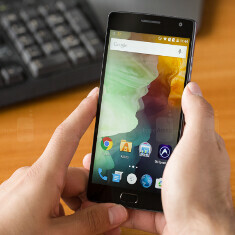 The so-called Flagship Killer didn't quite have the desired effect thanks to a considerable assortment of issues, all of which are explored in our OnePlus 2 review. Despite its shortcomings, though, the device does have its fair share of positives, such as a nice display, punchy loudspeaker and seamless fingerprint sensor. Additionally, with the Marshmallow-based OxygenOS 3.0.2 having recently rolled out for the device, many of the software issues we encountered during our review appear to have been rectified. Initially, the OnePlus 2 retailed at $389, but for $239.99 nowadays, the OnePlus 2 looks good value for money. Powered by the Qualcomm Snapdragon 810 alongside 4 GB of RAM and a 3300 mAh battery, you get a lot of bang for your buck. The eBay offer, which knocks $30 off the usual price, only runs for a couple of days, so move quickly if you'd like to purchase by hitting the source link. $30 off is nothing much. How about $200? I'll definitely consider the 1+2 at that price.